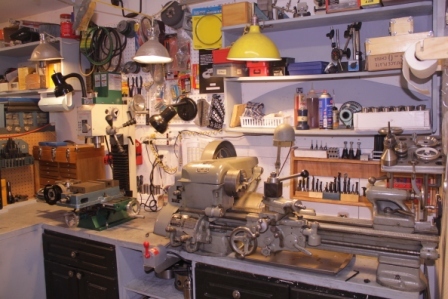 I used to get frustrated when I read about Amateur Telescope Making (ATM) projects that required machine tools since I did not have access to a machine shop. I still strongly support modest projects designed for the vast majority of telescope enthusiasts who do not have the inclination to buy a metal lathe nor the time to learn how to use it. It is great fun to test the limits of your skills with simple materials. I still enjoy making telescopes and parts from wood. It is a great challenge to make inexpensive telescopes that perform nearly as well as the best commercial products available. John Dobson inspired a lot of us! Eventually I discovered that I needed metal to experiment with some novel concepts and designs. As my ATM creations became more sophisticated I had to develop metalworking skills. It is very easy to be drawn away from telescopes. Home Machinists like to make their own tools and create wonderful mechanisms. It is an entire world! Though I have been seduced into a few such projects, I have steered away from all that and always return to my first love – telescopes. I am working on a page devoted to my six inch folded refractor. I could not have built it without my small home machine shop. I have come to love my lathe and mill as much as my telescopes. My Southbend 10K lathe is one of my most prized possessions. It is an exquisitely beautiful example of perfect design and functionality. 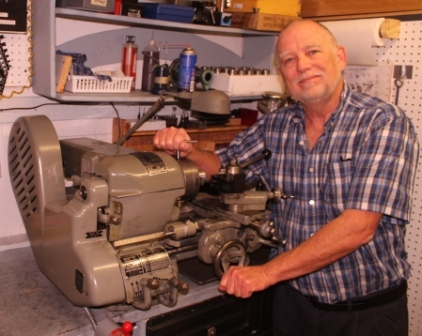 This entry was posted in Telescope Maker's Workshop and tagged Amateur telescope maker's lathe, Amateur telescope making machinist, folded refractor, home machinist on January 15, 2013 by DaveTrott.